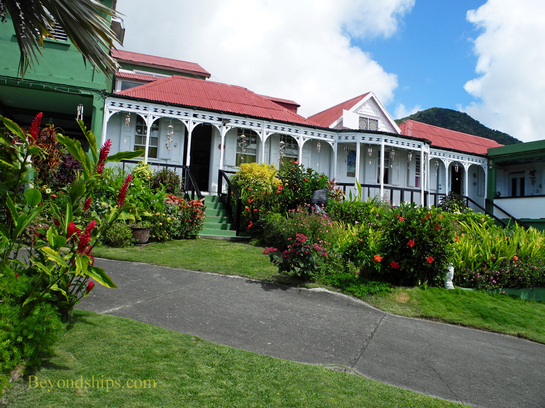 A much different plantation house can be found on St. Kitts at Clay Villa Plantation. This is a much smaller house than Sunbury and less luxurious. This is probably a result of the fact that the family that built it refused to use slaves to work the plantation. Clay Villa is still family owned and the owners, Phillip and Bridget, often lead the tours of the house and grounds. Phillip, a veteran of the Royal Navy, led the tour that I was on and his personality and engrossing narrative of his life, family and adventures captivated the group. Surrounding the house are lush gardens with a wide variety of colorful tropical plants. The gardens are also home to various animals that the owners have rescued including monkeys and parrots. A pool whose inhabitants include three small sharks is in one of the gardens. Inside the house there are pieces of hand carved furniture and Caribbean art. A separate building houses the Stanley Gumbs Museum, which houses various treasures that the family has collected over the years. The last stop was the pub underneath the main house. Here, visitors had a choice of soft drinks, beer or a rather good rum punch. What makes a visit to Clay Villa work is the presence of the family. It is a place where people live and that brings the property to life.